Though it's often painful to share the world with their kind, the sad fact is that some people just do not enjoy eating out. I don't just mean that they are intimidated by posh dining rooms or tasting menus, that they can't face the queues at Tayyabs or baulk at restaurant prices; I mean that no matter what the situation, no matter how good the food or reasonable the cost, even if there's no cost at all, there will be some people that can't enjoy any part of the business of restaurant-going. My grandfather was one such person. Brought up in working-class Liverpool, it's tempting to assign his restaurant allergy to a lifelong dedication to frugality, and given he would hoard ketchup and mustard sachets from motorway service stations there was certainly an element of that. But even if the money had not been an issue, I still doubt he would have been comfortable in restaurants; I think he'd always rather be the person organising and helping rather than being waited on, and he had little interest in food generally - his preferred lunch was cold baked beans eaten out of tupperware, straight from the fridge. Hey, don't knock it if you ain't tried it. After a nearly perfect lunch at the Parkers Arms, cossetted by warm service and fat on dishes of hyper-local, seasonal brilliance, I wondered if even my grandfather could have remained immune to the charms of this idyllic place, nestled in the hills of the Bowland in Lancashire. It's a picture-book ideal of a pub, the kind of thing you mean when you talk about going "somewhere nice in the country" but so very rarely find. Outside, the Victorian building is handsome without being austere, with a large beer garden overlooking the rolling Lancashire countryside. Inside, it's clean and spacious and charmingly un-modernised, two dining rooms split by a wooden bar, with a gentle buzz from families, young and older couples, and their pets. Pubs like this are my own personal heaven, and I could have happily spent all day here sampling the local ales and feeding pork scratchings to the pub dogs, even if the Parkers Arms didn't also happen to serve some of the finest food in the country. But yes, on top of everything else, the food here is utterly wonderful. Stosie Madi is the chef in charge, and she colours a menu of attractive pub favourites with Middle Eastern touches - their lamb rump is cooked with kamouneh, and kibbeh is occasionally spotted amongst the starters. Above is turbot roe made into a kind of light tarama, drizzled with dill oil and with bright, crunchy radishes for dipping. Another table snack were potato skins, presumably a by-product of the creamed mash, aggressively crunchy and great dipped in the tarama. Nothing on this stunning dish came from more than a couple of miles from the Parkers Arms' front door. Venison fillet, seared to medium-rare, dressed in foraged blackberries, cobnuts and girolles and drizzed with some kind of herb oil, it was the ultimate expression of the power of locality and seasonality. Far from ham-stringing a kitchen, the ability to step outside and use ingredients that have been a part of the nearby environment up until a few hours previously lends the food a vibrancy and immediacy that you just don't - can't - see in most restaurants. This wild (local) rabbit and (local) pork was chunky and full-flavoured, studded with pistachio nuts and served with a sweet house piccalilli. The portion size was so generous that some of it made it into our lunch the next day, and I can confirm it only improves with age. Grouse was on the menu, so obviously I had to order it. It arrived meticulously filleted off the bone, soaked in a fruit/butter gravy (local blackberries) and on a bed of yeasty bread sauce. There was so much plump, powerfully gamey meat that it almost looked like two birds' worth - it's amazing how much more protein a professional kitchen can extract from a carcass than my own ham-fisted way with a fork and steak knife. And if all that wasn't enough, there was a bonus skewer of heart and liver. Heaven. Even the chips were faultless - golden brown casings of smooth, buttery potato. I dipped them in the grouse gravy and ate them, eyes closed, in rapture. Other dishes, that I completely forgot to take a photo of because I was enjoying myself so much (naughty blogger) were equally brilliant. The aformentioned lamb rump in bulgur wheat salad was salty and crisp around the edges and smooth and pink within, boasting a massive amount of lamby flavour. And it's like a dagger through my heart seeing the menu items we didn't order - "Salt marsh lamb & cockle pie, lamb fat pastry", "Pork & venison pie in pork fat pastry", "Potted Lancashire cheese & Bowland ale rarebit" - careful, considered, intelligent dishes that read like poetry. I know, I'm gushing. Again. There's been a lot of it from me recently, what with Moor Hall and Coombeshead Farm and Where The Light Gets In; I am just as determined today as I was when I first started the blog that 10/10 scores will only be given out when the experience of eating at a particular restaurant is as close to perfect as makes no odds, but I'm thinking maybe I need a new definition of perfect. The standard of restaurants in this country, at least from the mid-range upwards, continues to astonish and delight, and Parkers Arms is a pretty much ideal gastropub experience, but I can't rule out somewhere else down the line - perhaps even one of the PA's neighbours in Bowland such as the Freemasons at Wiswell, or the Swan at Fence, both of which are on the list - impressing even more. What happens then? Well, I'll cross that bridge when I come to it. And anyway, what a lovely problem to have. Meantime, know only this - that you'd have to have a heart of stone not to be completely smitten by the Parkers Arms; if you can't enjoy yourself here you may as well just give up and stay at home eating cold baked beans out of tupperware. I will be back as soon, and as often, as circumstances allow. In the interests of full disclosure, I'd known the Parkers Arms on Twitter for a few years before this, my first visit, and so I can't pretend we didn't get a couple of extra bits and pieces that maybe the average walk-in wouldn't. However we paid for all our main courses and drinks and would obviously quite happily do so again. Whatever your thoughts on Uber's corporate policies, the fact is their expansion out West has turned a day trip out to Berkshire to sample one of their surprising number of very nice gastropubs from a rare treat to a far more attractive and affordable proposition. Where once the last leg of the journey involved being ripped off by official cabs whose minimum charge for any trip, no matter how insignificant, appeared to be £15, the hop from Maidenhead station to Burchett's Green is now £7. Bargain. Which means I and a friend arrived at the 18th century village pub The Crown with extra money in our pockets for a nice cocktail, one unfortunately I've forgotten the name of but which involved fizz and bitters. Like everything at the Crown, it's heavily French-accented; the building - and service - may be as charmingly English as tea and crumpets but chef Simon Bonwick's style is very much traditional gallic haute cuisine in a way you sadly see very often these days. In the bar before lunch alongside our cocktails we got to nibble on these cute little canapés, containing hummus, olive and almonds. On a doily, because you really don't see enough doilies in modern restaurants. I should also take a moment here to mention our table at the Crown, in a cute low-ceilinged space overlooking the main room which is one of the more quaint and cosy spaces I've ever had my lunch, and I highly recommend you asking for the same if you ever make a booking. First of a four-course "surprise" menu offered by the restaurant (and which we weren't likely to say no to) was this frankly vast pile of fresh crab meat, offered with the advisory "just watch out for shell, dad's eyesight isn't what it was" which just made me love the whole thing even more. They needn't have worried, anyway - there was no shell, and even if the reality of ploughing through so much white meat was more attractive during the first few mouthfuls than the last, you at least can't fault their generosity. Fish course was monkfish, dressed simply in a herby tomato dressing and topped with silky, buttery pulses. This was Mediterranean-French cooking of a kind I'd not seen in a little while, and it was nice to be reminded how nice monkfish works in this rustic (albeit expertly constructed) style. Main course was so French if you listened closely you could hear it sing La Marseillaise. A neat little medallion of what I think they said was veal shoulder, tender and perfectly-seasoned, was draped in a jus so thick, salty and syrupy it probably took three years off my life just looking at it. With that, a vast sweetbread, crisped-up and golden brown and without a hint of the mealy dryness that can affect these things, and some vibrant root vegetables, "turned" into neat little shapes that would have made Escoffier proud. Of course this wasn't a groundbreaking arrangement of ingredients but there are so few restaurants willing - or indeed able - to turn out such unashamedly haute cuisine dishes that you can't help but applaud them. Oh, and a word on the potatoes, bubbled up and brittle outside and silky smooth inside - there's probably a very fancy French term for them but I don't know what it is, so "world's best roasties" will have to do. You also have to admire anyone going to the effort of making their own canelles, a process I'm reliably informed is about as tortuous and difficult as pastry work gets. This version involved salted caramel, which is a twist on the traditional I fully support. Desserts came in two forms at once, for sharing. This is "Tulasmeen raspberry bavarois and sorbet", a pleasant arrangement of summer fruit which charmed with old-school silver-service vibe even if the overall effect was somewhat less than stunning. Lovely sorbet, though. Similarly, "White chocolate and praline cadeau" wasn't quite the gift that kept on giving - it was rather an overwhelming amount of sweet, creamy white chocolate and not much else - but perhaps by this point it was possibly rather more the fact we were quite full than anything particularly wrong with white chocolate and praline that meant we didn't quite finish it. 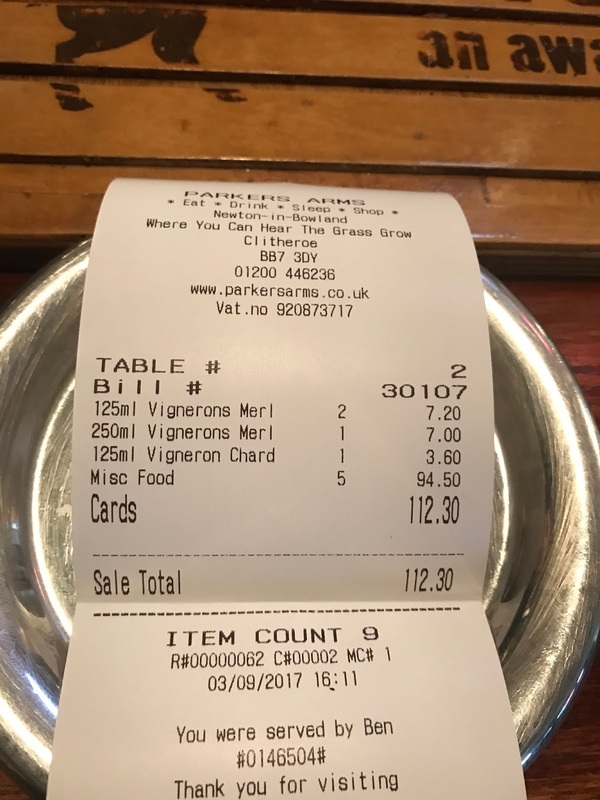 The bill, with 2 wine tastings, a coffee and two very nice Armagnac to finish came to £147 - an incredibly reasonable amount of money to pay for what had been an enjoyable and technically proficient dinner, and all served with an easy, family-run charm (some of the Bonwick clan trained in some serious multi-Michelin-starred restaurants in France but have since returned to the nest). We toddled home (again, thank you Uber) very happy indeed, which really tells you all you need to know. No, food like this isn't very trendy or fashionable - when was the last time you saw veal on a menu, never mind turned vegetables - but who cares? 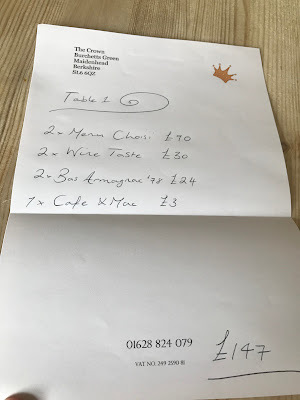 Far better for Simon Bonwick to cook the food he likes to eat than pander to any ridiculous fads and start littering his menu with nasturtium oil and sea buckthorne just for the sake of it. This was a lovely lunch, a reminder that the French culinary traditions are still right about things far more than they're wrong, and The Crown at Burchett's Green comes highly recommended. Vive la France. The Rolling Stones would have you believe "You Can't Always Get What You Want", and in the vast majority of cases, in life in general and the restaurant industry in particular, this holds true. Running a restaurant is generally about compromise - making the best you can with a tiny space, making pasta and preparing veg in the dining area before the customers arrive, squeezing an extra table for two next to the loos to turn enough of a profit on weekends to cover you in the week, setting up your Big Green Egg in the car park next to the fire exit. It's a very lucky person indeed who gets to dictate exactly the shape, size and ambition of the restaurant they want to run, and are given the resources to make that vision a reality. Mark Birchall is a very lucky person indeed. It's hard to believe any British chef in modern times has had an opportunity like the one he's landed at Moor Hall, an exquisitely refurbished Tudor mansion on the outskirts of Ormskirk (of all places) set in acres of walled kitchen garden. Even my photos here can't possibly do the place justice - the scale is breathtaking; polytunnels groaning with chard, spinach and turnips; neat borders of borage, lovage and thyme; greenhouses of cucumber and peas. Part God's Own Larder and part food lover's wonderland, it's a kitchen garden as imagined by Lewis Carrol and Percy Thrower, an incredible achievement and great fun to while away time before dinner, seeing if you can guess which of the myriad of pods, berries and leaves will end up on your table that evening. Inside, original 16th century details such as carved mantlepieces, huge stone fireplaces and beautiful oak doors are lovingly preserved in the bar and reception area at one end of the building, while the other opens out into a modernist dining room, all clean lines an floor-to-ceiling windows looking out over the barn and duck pond. It's clear that very intelligent, hospitality-focussed minds have been the driving forces behind the build, and as much as it's a vanity project for the chefs, it's at the very least as much customer-driven where it matters. It is a wonderful space to eat your dinner. But let's not let the building get all of the credit, because all of this spectacular horticulture and architecture would mean little if there wasn't the talent in the kitchen to make the best of it. Fortunately, Mark Birchall has a pedigree second to none in Modern British cooking, and with this bounty of produce on his doorstep (literally in the case of the garden, and figuratively in the case of the Goosnargh duck, Herdwick lamb and a myriad of other exemplary North Western suppliers) has created a tasting menu of such consistent joy and delight that, even in these early days, it deserves to be spoken about in the same breath as the very finest restaurants in the country. After a sample of charcuterie (because what kind of restaurant are you these days if you don't cure your own pork?) and drinks (rosehip and herb tonic, I think - very nice anyway) in the bar, first of the snacks substantial enough to make it on to the printed menu were these little pillows of black pudding and pickled apple, jet black puffed corn casings injected with a smooth, fluffy filling. Visually arresting (especially presented in a volcanic-black tagine), technically impressive and bursting with flavour, it was an early sign that Moor Hall meant serious business. Cute little baskets of crisped potato held smoked curd and fermented garlic, and were topped with flowers from the garden. If I'm going to be absolutely brutal these looked better than they tasted - a bit wet and bland - but as perhaps the only one of thirteen or fourteen dishes that I wouldn't rush to try again this isn't much to complain about. ...whereas other times, as in this oyster dish, a number of clever kitchen techniques are on display, from a gently-poached oyster, a bright-green dill oil very much from the Rogan school, and a vegetal snow which dissolves delightfully on the tongue. The basic template of the mackerel and the oyster dishes are similar - premium seafood lifted by fresh vegetables and herbs - but the kitchen knows when the texture of the main ingredient needs clever textures to sharpen and frame it, and - as with the mackerel - when it's better to leave alone. Baked carrots, sweet and with a firm yet yielding bite, came dressed in a sour/sharp sea buckthorn sauce and would have been impressive even without a gorgeous blanket of unpasteurised Doddington cheese snow draped on top. Again, top ingredients treated to intelligent, and just the right side of showoffy, techniques to very successful effect. In the next dish a neat square of what I think must have been crab claw meat came accompanied by sheets of transluscent crunchy turnip, leaves of gently aniseed-y anise hyssop and oaty toasted sunflower seeds. Over the top was poured a seafood consommé. Clean, clear flavours from high quality ingredients given the room to shine. Great stuff. This arrangement of shapes and colours was essentially a beef tartare, but one where the beef (Holstein Friesian) played a more subtle base note and chunks of barbecued celeriac, powdered shallot, blobs of mustard mayonnaise and impossibly delicate sheets of dark (squid ink?) melba toast danced dramatically around. Having spent the first twenty years of my life in this part of the world it was somewhat of a surprise to learn that Banks (near Southport) is somewhat notable for specialist tomato growing. I've always been a bit of a cynic when it comes to tomatoes grown outside of very sunny, hot areas - even the best Isle of Wight tomatoes aren't really anywhere near as good as those from the Mediterranean - but these were actually lovely. Admittedly that might have been something to do with the chunks of silky smoked bone marrow, or chunks of puffed wheat crackers, but still. These aren't on my printed menu but I think they were onion brioche rolls, similar to those they used to serve at the Ledbury. Soft and warm, with a rich buttery flavour, despite being so many courses in it was impossible not to polish off a whole one each. One of the great joys of eating in a restaurant like Moor Hall is hearing the gasps of delight around the room when other tables are presented with another visually stunning plate of food. On our table, I think this turbot dish drew the biggest reaction - isn't it just beautiful? Needless to say the fish itself was faultlessly cooked, solid and meaty without being in the least bit dry, as only the best turbot can be. But the crisp nuggets of jerusalem artichoke, oyster leaves and a myriad of salty sea succulents all played their parts perfectly. Finally, it was time to put all of the technique and invention we'd seen in the meal so far into a definitive, satisfying conclusion to the savoury courses. Duck, firstly, was immaculate - uniformly pink, boasting a proper deep, rich flavour and presented with various blobs of summer fruit and roots, elderberries and beetroot. But even better was Herdwick lamb, a better bit of baby sheep I don't think I've ever had in my life. Who knows what clever techniques they'd used to get the flesh so tender and moist but while keeping a dark, crisp, salty edge to the fat - probably a combination of charcoal-roasting and slow-braising though I'm obviously just guessing - but it was utterly wonderful, even before being draped in a thick, sticky anchovy and onion gravy. This dish would have been worth the trip to Omskirk on its own. On the side came a little pot of lamb offal and cheese, deeply flavoured and gloriously addictive. The transition to desserts began with palate cleanser - twigs of crystallised ginger on some kind of pine-flavoured yoghurt I think. The use of pine as a flavouring is another Rogan-style flourish, one I remember from l'Enclume, and is wonderfully evocative of forest floors and the late summer. Plums, poached in syrups I think and presented with almond yoghurt and fruit snow, was another strictly seasonal and intelligently constructed thing, textures and colours that surprised and delighted. Next blackberries, whole and as delicate sheets of meringue, came with a very clever buttermilk custard and finished with blackberry "snow". Constructing a satisfying dessert that isn't going to be a challenge to eat after twelve or so preceeding savoury courses is a difficult task, but we polished these last few courses off with ease - this is a menu that has been pitched and played perfectly. We finished full, certainly, but not overwhelmed. And very, very happy. As problems go, worrying about having to give out too many 10/10 scores in the space of a month isn't the kind of thing that's going to elicit much sympathy - especially as in this case the meal was a PR invite and our only expense was the Merseyrail to Town Green, a cab home and a bit of cash for the front of house (who were, by the way, uniformly brilliant in every way). But the more I think about it, the more I'm certain that there's nobody who wouldn't enjoy a meal at Moor Hall, and nobody would feel that the astonishing amount of skill and effort that's gone into every single aspect of an evening there wouldn't be worth the money they're charging for it. Yes, it's expensive, but this is, as I said earlier, already one of the most accomplished restaurants in the country - and unlike far too many other places charging this amount (£95/head) you really get what you pay for. So full marks it is, and I defy anyone to spend an evening here and disagree with that assessment. A rare example of everyone involved in a project getting everything right, Moor Hall a profound and spectacular achievement in the kitchen garden restaurant model, and a new benchmark for modern British cuisine. Very well done indeed. I was invited to Moor Hall and didn't pay.